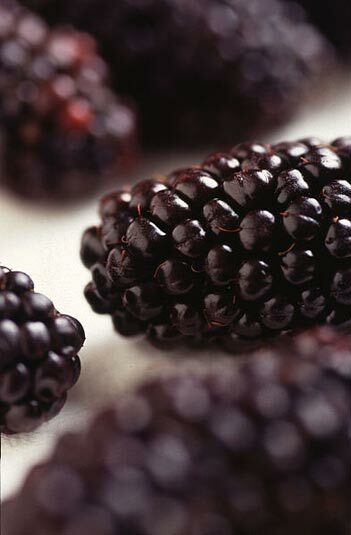 The blackberry is an edible fruit produced by any of several species in the Rubus genus of the Rosaceae family. The fruit is not a true berry; botanically it is termed an aggregate fruit, composed of small drupelets. The plants typically have biennial canes and perennial roots. Blackberries and raspberries are also called caneberries or brambles. It is a widespread, and well known group of over 375 species, many of which are closely related apomictic microspecies native throughout the temperate northern hemisphere and South America. Thornless Blackberries need full-sun, are spring flowering and summer fruiting. Our plants are grown on supports with well-drained fertile soil. This variety is widely cultivated for fruit production and for domestic production. This variety should not be confused with the weed variety.